Some of the most powerful words are those of real people sharing their stories. Some of the quotes below were emailed to me (with permission to share), and some were posted as comments on my website. Here is a sampling of the real words of people who grew up with CEN. The first 16 years of my life that my family lived together, I can’t remember a single meaningful or real communication that occurred between any of us in that time. My feelings and emotions were the last things on my parents’ minds. The best they could do was provide a home with basic amenities. I honestly don’t remember my parents much at all, though both are still alive and married today. I never heard the phrase “I love you.” There was no one to talk to, no one who cared. I brought myself up in every sense of the word. I remember the intense indescribable pain that I felt as a young child when my mother wouldn’t acknowledge the simple child affection I wanted to give. I do not know how to tell my story, and I do not know what I feel, and even I cannot remember most of my childhood. All my life I had felt the emptiness. I got so desperate to find out why I felt the way I did. Despite my parents being wonderful people themselves and giving me everything possible, why did I feel so ungrateful angry and tearful? I have the outward appearance of total success, great husband and kids, great job, financially secure. But I lived my whole life in a depressed state, while publicly trying to maintain a façade of good cheer and happiness. No one knew about the suicidal thoughts that plagued me at various points in my life. I felt a deep howling despair as a child and into adulthood, and never, ever understood it. Being neglected, you have learned and know no different. That is the world to you, almost from the moment you are born. And you believe it is your fault and unchangeable. Again because of the neglect, no one tells you any different. No one pays attention or even notices you. People use words like depression – ok, yeah – deep sadness – ok yeah that too – but it’s more than that. And it can be your friends that don’t get it too even though they love you and they care about you – it’s so hard to explain, even to yourself. 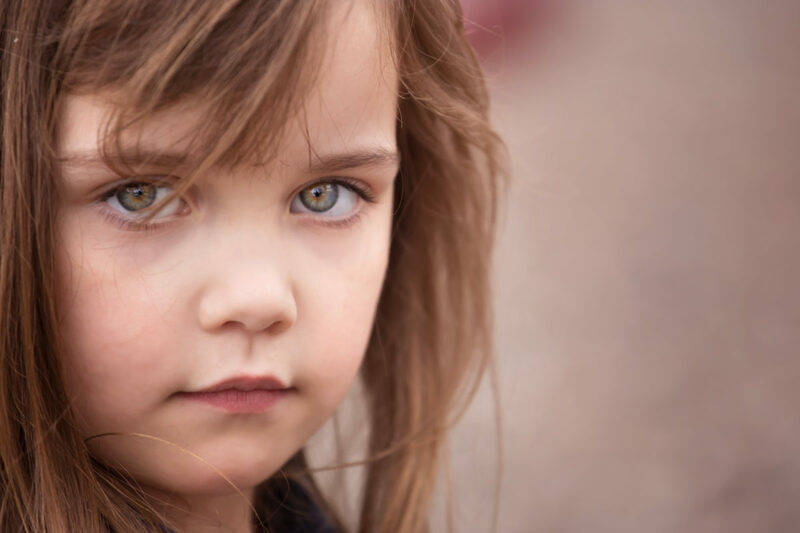 I think when a lot of people think of childhood neglect, they see in their mind’s eye some child in tattered clothes, underfed, living in raggedly surroundings. They think, this couldn’t possibly be happening in a nice house, to a child with nice clothes, who is so well behaved and does well in school. But the raggedy, underfed tatteredness is inside. And like you said, hopefully we can learn. I know I sure did, but it did take a while and a lot of work. It’s so hard to figure out especially when a lot of people don’t get it. 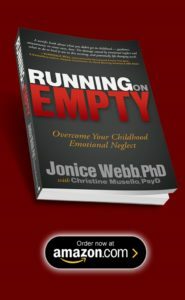 Not until I went through tremendous hardship, and being completely alone during all of it was I even able to come to the conclusion that I had been severely emotionally neglected. At least now, things are getting better. Much, much better. Now I understand and have started taking the steps suggested. I hope one day I successfully create a positive voice in my head which I can own. With the understanding of CEN, I was able to “plug up” the holes and start the recovery process of “filling my tank.” Although I am not out of the woods yet, at least now, I know the problem…because knowing and understanding the problem is half the solution. Now I no longer revolve around a complete unknown. My children and I have many discussions about CEN. 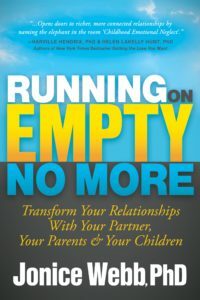 We are a work in progress and moving forward in healing the hurt which will help them to become a good parent. To all of you who have shared your stories, and all who have yet to reach out, I want to say: You, the silent sufferers of this world are the ones who hold the answers. Now that you see what is wrong and why, you can stop blaming yourself. You can see who you really are and let others see you too. You can start to fill that empty space and know that you deserve more. The pain of a child who is growing up unseen, the emptiness of the adult who feels unknown, the strength that comes from facing the invisible. These are the voices of courage, the sounds of healing. 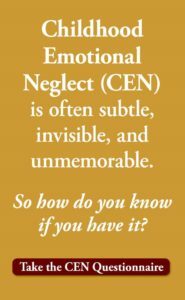 To learn if CEN is at work in your life, Take The Childhood Emotional Neglect Questionnaire. There’s nothing like the shock and at the same time relief of realizing what was happening to me all those years. It makes you feel broken and alone. But to know what it is and to scratch the surface of something that can fill that emptiness is a blessing. It was said so perfectly, if you don’t know any different then how do you know it’s a problem. You can’t know what you don’t know. Especially if what’s happening is so subtle that most people would not think twice about it. Thank you from the bottom of my heart for sharing these articles and for giving us some answers, some light to the darkness we have been in for so long. Dear Anna, I am glad to have been able to answer some questions for you. All my best wishes! I didn’t have the words to explain it back then. I knew that I was unhappy. I didn’t usually know why. Dear Wendy, that is the experience of the CEN child. I’m sorry you went through that as a child.